Wild blackberries, or brambles, have always been in plentiful supply in hedgerows, and have been gathered and used in many different ways for centuries. Mark Cross is no different, try the various footpaths for a plentiful supply in the autumn. Avoid roadside fruit as this may well be contaminated with vehicle pollution. 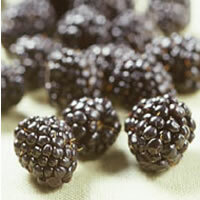 Put the blackberries and half the water in a large saucepan and simmer gently until soft. Put the apples into a separate preserving pan with the remaining water and simmer gently until soft. Pulp with a wooden spoon or potato masher. Add the blackberries and sugar to the apple pulp, stirring until the sugar dissolves, then add the butter. Bring to the boil and boil rapidly, stirring frequently, for about 10 minutes. Test for the setting point and, when it is reached, take the pan off the heat and skim the surface with a slotted spoon. Pot and cover the jam.